See if a Boker hunting knife offers the style and features you're looking for. Are you looking for a Boker hunting knife because you own or have seen another type of German made Boker knife that impressed you? It wouldn't surprise me, because that's kind of what happened to me. I needed a new knife to use on the job, and instead of getting a more affordable major brand-name knife, I decided to spend a few extra dollars for a German made Boker folding knife, the model 90 X Badger. I've found it superior to all of the knives I've used previously, so as far as I'm concerned, the slightly higher price was money well spent. Several practical models and styles of Boker hunting knife are available, and you'll find you can choose from a variety of fixed blade or folding knives, carbon or stainless steel blades, and beautiful, durable handle materials. 4 5/8" drop point blades forged from 440 C stainless steel. The finger guards are forged integrally with the blade, and the Model 585AM has an integrally forged pommel. The handles are carefully crafted with finger grooves to improve the hold on the knife, and you can choose handle materials of Amboina, Palisander Rosewood, or Stag horn. Of course, these German knives come with leather sheaths. These knives are attractive, designed to be efficient, and built to last a life-time. Look for Models 585AM, 541, and 529 Integral. Several patterns of folding Boker hunting knife are available. If you're looking for a heavy, solid, handful of knife, the Model 4021 is a large, classically styled outdoorsman's & hunter's model. 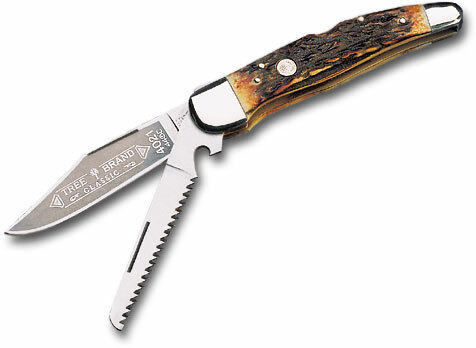 It is a locking blade folding hunter with a 4" 440 C stainless steel clip blade and a stainless saw blade. Thanks to its size and weight, this knife is able to clean game and then take care of the rest of your camp site chores too. 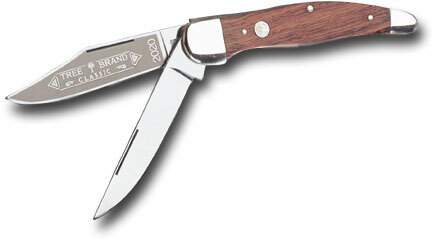 This knife is 5 1/4" closed, and comes with stag handles and a leather belt sheath. An almost identical model in the same weight class is available with non locking blades: A 4" clip blade and a 4" skinning blade. This knife is also 5 1/4" closed, and offers you a choice of carbon or stainless blades, and Stag, Delrin, or Rosewood handles, and of course it comes with a leather belt sheath. Look for the Boker 2020 and Boker 2020HH. If you prefer something a little smaller and lighter, a medium sized, lock back, folding Boker hunting knife is available with a single 3 1/8" clip point blade of 440 C stainless steel. You can choose handle materials of Delrin, Buffalo Horn, Thuya wood, Rosewood, Stag, Bone, or Mother of Pearl. These knives also come with a leather belt sheath, except for the Mother of Pearl model, which comes with a wood presentation box. Slightly larger, but not heavy-weights, Models 2000, 3000, & 4000 are lock backs with a single 3 3/8" drop point blade of 440 C stainless steel. These knives are 4 5/8" closed, and come with a leather belt sheath. Once again you have a choice of Bone, Rosewood, Stag, or Thuya handles. The Optima is a medium sized Boker hunting knife that offers the advantage of interchangeable blades. 3 5/8" blade of 180 layer damascus, forged in Sweden, of ATS-34 and 440 A stainless steel. How much game can a Boker hunting knife clean without being re-sharpened? 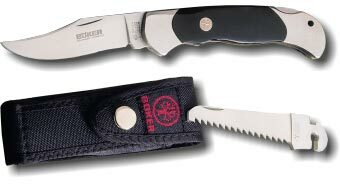 It is one of the Gemini series folders, with a Zytel handle, and 3 3/8" drop point ceramic blade. Whatever your preference might be; traditional, classical style or modern space age, you can be sure your favorite Boker Hunting Knife is rock-solid and dependable. Return from Boker Hunting Knife to the German Knife .com home page.